Monroe “Mickey” Marsh passed away at the age of 91 on Monday, April 1, 2019 at East Jefferson General Hospital. He was the loving husband of the late Fredalee Pollock Marsh, who he was married to for 64 years. 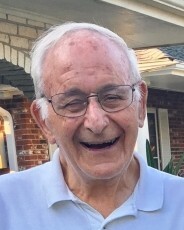 He is survived by his three daughters, Sherryl Marsh of Buford, Georgia; Barri Marsh Bronston of Metairie; and Donna Marsh Goldenberg (Eric) of Marietta, Georgia. He is also survived by the other two loves of his life, his granddaughter Sally Rachel Bronston of Arlington, Virginia and Trevor Michael Goldenberg. In addition, he is survived by his nieces Leslie Slobotzky Ressler and Terrie Slobotzky Welz (Tom) and his nephew Michael Slobotzky. Mickey was born in The Bronx, New York on Sept. 28, 1927 to the late Samuel and Ray Moshkowsky. In addition to his late wife Fredalee, he is preceded in death by his brother Myron Moshkowsky and many loving aunts and uncles. Following high school graduation, Mickey served in the U.S. Army, then enrolled at Tulane University, where he earned his business degree in 1952. He was a lifelong Green Wave fan, sticking by the baseball, basketball and football teams through thick and thin. He was a member of Congregation Gates of Prayer, B’nai B’rith and the Jewish War Veterans. He was also a 25-year volunteer at the Audubon Aquarium of the Americas. Funeral services will be held Wednesday, April 3 at 11 a.m., with visitation beginning at 9 a.m. at Congregation Gates of Prayer, 4000 W. Esplanade Ave, Metairie. Rabbi David Gerber officiating. Burial will be at the Gates of Prayer cemetery on Joseph Street immediately following services. In lieu of flowers, donations to Gates of Prayer or the Tulane Athletics Fund preferred. Arrangements by Tharp-Sontheimer-Tharp, 1600 N. Causeway Blvd. Condolences may be expressed online at www.tharpsontheimerhf.com. Information 504-835-2341.